The month of June holds a special place in our Haiti story, because it is the month we moved here in 2015. As we flew into Haiti on June 8th, there was a new and refreshing sense of adventure in our hearts, longing to hit the ground running to see this dream that God has placed in our hearts become a reality. 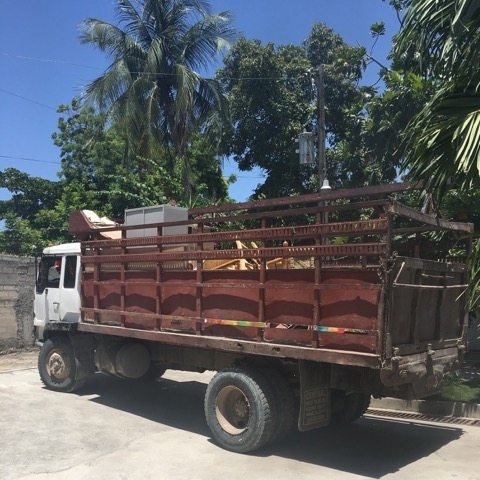 We spent a week in Port au Prince finding and purchasing the necessities to furnish and prepare the Potter & Clay Ministries Nutrition Center. We filled a large truck with furniture, supplies, and other items and sent it on its eight hour trek to Mare Rouge in Northwest Haiti. We are so thankful for everyone that gave and prayed to make this possible for us! Rebecca's cousin, Jessica Brister, came to visit us and assist in setting up the Nutrition Center. Because Jessica works as a pediatric ICU nurse, she was an asset to us as we prepare to open. During her week here, we met a two week old set of twins that were having trouble gaining weight. We were able to assist their mother with breastfeeding and will be conducting home visits to ensure they continue to grow. We look forward to the day that the Potter & Clay Ministries Nutrition Center is open so we can receive moms and babies and give them around the clock support and care. After taking Jessica back into Port au Prince to catch her flight, we were able to spend time with Rachel Charpie from But God Ministries in Ganthier, Haiti. Rachel has recently opened Bread of Life Malnutrition Center and we were excited for the opportunity to spend time with her and learn from her progress. From shopping in Port au Prince and sending a large truck to our center with necessary supplies, to having cribs painted and installed to meeting sweet babes who motivate us to serve our area better - this month has been full of promising preparation and coordination. Our startup budget is 100% funded! We have felt so loved and supported in the announcement of Potter and Clay Ministries. To those of you that have committed to pray, become monthly sponsors, made one-time donations, and given words of encouragement in this new adventure - thank you so much! for their very generous contribution of $20,000 to complete our initial fundraising goal. We can't wait to see how the Lord uses this gift and are so gratefull. Thank you for being involved in Potter and Clay Ministries. Without your support and prayers, we would not have made this progress in the month of June. We have taken big steps so far, and we can't wait to see what God does through your prayers and partnerships in the coming months. Follow us on Instagram to see updates from Haiti in real time!